There it is, in all of its glory – Sylvan Library! This week, we’ll be going over some of the interesting interactions that might come up with Sylvan Library. But today, we’ll just go how the card works in general. The Library has a triggered ability that triggers at the beginning of your draw step. This trigger will go on the stack after you’ve drawn for the turn. When the trigger resolves, you can draw an additional two cards. You don’t have to use it if you don’t want to (the ability is optional). If you do choose to use it, you’ll choose two cards you’ve drawn this turn. This doesn’t just mean cards you drew from the Library, but any card you’ve drawn up to this point. 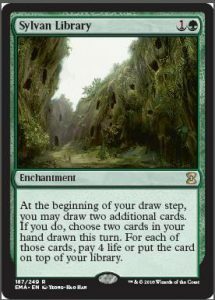 For instance, if there’s a Howling Mine on the battlefield as well as the Library, you’ve drawn four cards this turn (one for your turn, one from the Mine, and two from the Library), and any of those will be eligible to be picked. For each of those two cards, you have a choice: you can either put the card back on top of your library, or you can pay 4 life to keep it in your hand. If you’re feeling brave (or you just don’t care about your life total), you can even pay 8 life to keep both of those cards. If you’re putting two cards back, you get to choose the order they end up in on top of your library. Oh, and be sure to always use the Oracle text, no matter which version you use. The Eternal Masters version uses the current text, but older versions say slightly different things (or, in the case of Fifth Edition, vastly different things. Don’t even ask why the Fifth Edition text transformed it into an activated ability). This is a good tip for any old card, but especially relevant for the Library. Well, that’s all we have for today. Be sure to check back every day this week, as we’ll be covering other interactions with Sylvan Library all this week. We’ll see you tomorrow!